Ontario CA | Flue Steam Inc.
Today Ontario CA is a thriving transportation and logistics center, but like many southern California communities it started out as an agricultural area. Citrus farming was especially popular. The reason farmers were able to find success in Ontario CA has to do with the efforts of a developer that set up an irrigation system to help channel water from the mountains to the valleys during dry times and prevent flooding during rainy times. Today, water control is still important, but for owners of commercial kitchens, kitchen air control is a more immediate concern. 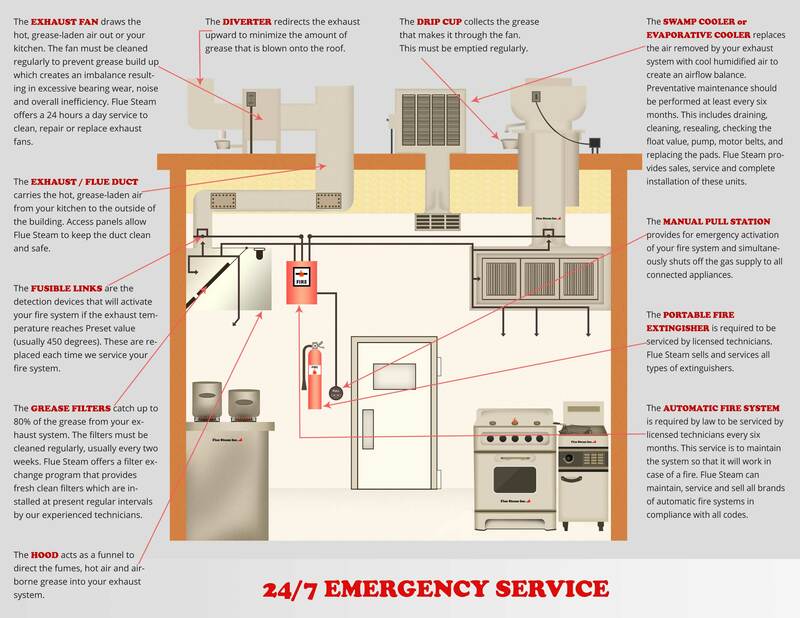 Flue Steam can help by providing all the services needed for commercial kitchen air control and fire prevention, including exhaust system cleanings, swamp cooler service, and automatic fire suppression equipment. We provide both hand scraping and steam cleaning of kitchen exhaust systems as well as grease filter exchange services. Contact us today for code-compliant cleanings and inspections.